SRT LOGISTICS has just completed a $600,000 truck washing facility that captures and recycles rain water at its distribution facility at the Brighton Industrial Estate. 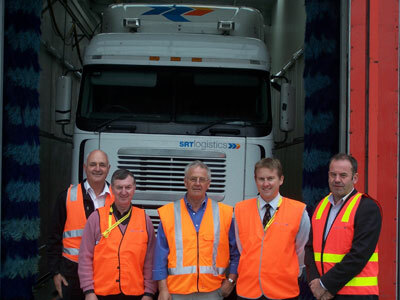 From left, Robert Hazell of Hazell Bros, Brighton Mayor Tony Foster, Jim Miller of SRT Logistics, Brighton municipal engineer Heath MacPherson and David Beattie from STEPS Tasmania. With the support of the Brighton City Council, SRT Logistics applied for funding assistance from the Federal Community Water Grants Scheme and received a grant of $190,000. Managing director of SRT Logistics, Jim Miller said they had been planning the redevelopment of their Brighton distribution facility since 2007. “The business needed to extend the existing warehouse and increase refrigerated storage capacity to meet the growing needs of SRT’s expanding customer base,” Mr Miller said. “We also needed to develop a new truck washing area to keep up the high standards of presentation the company sets itself. “We wanted to ensure that the wash facility was up to the latest standards in environmental practices, particularly water conservation. “With a 3500 sq m roof area the site is ideal for water collection. The water is used in the truck wash then recycled through a treatment system, and re-used several times. The water is finally used to irrigated a new tree and garden plantation around the perimeter of the 10-acre site. “The facility was officially opened in October by Brighton Mayor Tony Foster accompanied by Brighton municipal engineer Heath MacPherson, the builders’ representative Robert Hazell from Hazell Bros. and David Beattie, general manager of STEPS Employment and Training whose trainees grew the trees and undertook the garden bed construction, mulching and planning.